3 Rivers Comicon is putting the COMIC back in Comicon! 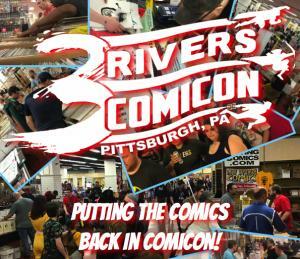 3 Rivers Comicon has set out to be a convention for comic fans and creators alike. With over 100 artists/writers/creators and almost as many vendors or everything nerdy, this show is one not to miss. The show is dedicated to cultivating the comic culture and community by bringing in some of the bigger names in the industry. Past guests include: Mark Waid, Tim Truman, Matt Hawkins, Joe Linsner, Kevin McGuire, Ron Frenz, Pat Olliffe, Scott McDaniel, Robert Hack, Brett Breeding, Justin Jordan, Amy Chu, Ed Piskor, Jim Rugg, Daryl Banks, Marty Egland, Peter Krause, and many more. 3 Rivers Comicon has also included publisher guests: Black Box, Dynamite, Valiant, Golden Tree, Action Lab, and Top Cow. With events such as cosplay contests, gaming, role play (larp) experiences, and amazing panels, you will always find something to do at the show. And do not forget to shop the massive artist alley and seasoned vendors from all over the East Coast. Comics, tee shirts, pop vynls, gaming, you name it, they have it! Come out and join us for a weekend of family fun and a whole lot of comics. Keep up to date by checking out www.3riverscomicon.com or following us on social media! Waterfront (Fromer Macy's Building) 162 E Bridge St.